Just to keep up on things before hiatus. Lets get our picks for the weekend up and finished. 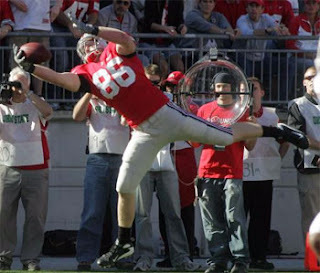 Ohio State defends Columbus against the visiting Wisconsin Badgers. Wisconsin has had the most success against the Buckeyes under Ji m Tressel and they even have been able to win in Columbus. The Badgers live and die with the running game and P.J. Hill. The every four year battle between my teams takes place this year in Cleveland as the Seahawks come to town to play the Browns. Now six weeks ago,I would have taken the S eahaw ks big in this game,but to my surprise both teams come into the game with the same record of 4-3. The interesting part of the game is that both teams strengths will go head on for the contest as the explosive Browns offense takes on the excellent Seattle defense. Can the improved Browns offensive line keep Julian Peterson,Darryl Tapp and Patrick Kerney off Derek Anderson and give him time to throw? If Anderson gets time, can the Seattle secondary manage to control the Cleveland receivers? The Browns defense has been unable to stop anyone,but the offense led by Matt Hasselbeck has not set the world on fire either. Lots of variables for this one and a factor could be that the game will start at 4:00 EST making the game more of a colder environment. Neither team has wins over good teams as between them only 1 of the teams that the two has beaten has a winning record (the Browns win over 4-3 Baltimore). The Seahawks 4 victims have a record of 8-22,while the Browns losing foes line up at 6-24. And as a bonus since the Browns and Hawks are playing each other. 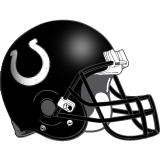 The huge game in Indianapolis between the Colts and Patriots. We like the Colts 38-31. Predictions on the Calzaghe-Kessler and Marquez-Juarez fights later in the week. The New Jersey Devils return to action against the Tampa Bay Lightning this evening in a important game for the Devils,who have not played a full quality game all season. I see flashes of hope,but things need to be done for 60 minutes. If things do not shape up soon,I think changes will be imminent and it will be personnel not coaches. Three big Goulet memories for me. 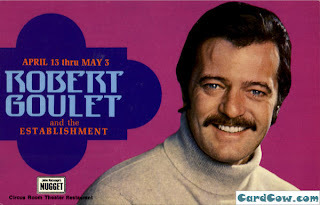 One-Elvis Presley hated Goulet and reportedly shot any TV that Goulet appeared on with his pistol! That is a lot of dislike! Two-The great ESPN Commercials that he did years back for college basketball. Three-His miscues of the words to the National Anthem when singing it before the Ali-Liston rematch. I liked Goulet because,similar to William Shatner,he seemed to "get the joke" and be able to laugh at himself with us. Thanks to Battlin Bob for the link! Applebee's restaurant chain has been bought by IHOP. The Applebee's here closed years ago and I like IHOP a lot. Sadly,I rarely go there since the local IHOP has an employee who doesn't seem to realize that that patrons go there to enjoy a good meal,not catch up with him. The fellow in question isn't a bad person,just someone that cannot realize the above point. The Pirates AA affiliate,the Altoona Curve will be celebrating their 10th anniversary next year and will be wearing uniforms based from the 1920's for all Sunday home games. The design looks great and the idea is good as well. One of our forgotten superstars is returning to the game. Ted Simmons has been hired as the Brewers bench coach. Maybe his return to the field will help get him more recognition for the great career that Simmons had. A small maneuver for the Pirates as Luis Munoz was added to the 40 man roster. In order to make room for Munoz,Josh Shortslef was designated for assignment. Two cards signed from Phillies infield prospect Jason Donald from earlier this season. Donald was promoted from Lakewood to Clearwater the day of Lakewood's first visit to Hagerstown. Checking up on the Shadow Draft. Here is a look back at the Pirates Shadow Draft that I did after the MLB Draft. Good news is that I was able to sign my first five picks and all look to be better than the actual Ed Creech picks. Bad news is that I tried to grab guys with high upside with picks 6 through 10 even though they would be tough signs and I was able to sign just one of them. So I will not be giving myself any comp picks for next years shadow draft,but I will give some more money since I did not spend as much this year. Round 1) Matt Wieters C Georgia Tech,SIGNED by Baltimore. Wieters signed with the Birds but did not play in the minors. He is currently playing in the Hawaii Fall League. Weiters will likely start at High A Frederick next year,but will not stay there for long. Desme played in 12 games for short season Vancouver hitting .261,with 1 homer and 6 RBI. Desme will likely start at Low A next year. Soto batted .303 with 2 homers and 28 RBI with the GCL Reds. 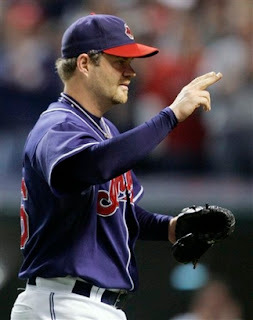 Nefti could start at Low A Dayton,but more likely to stay at extended spring training before moving to short season. Middlebrooks signed with the Red Sox,but didn't play in any games. No word on whether the Red Sox will start him as a 3rd baseman or pitcher. Look for him to stay in Florida and start with rookie ball next season. Meyers dominated in his 4 Hagerstown starts going 1-1 with an 0.44 ERA. Meyers didn't fare quite so well in 3 starts in Potomac finishing 0-0 with an 5.06 ERA. Meyers will return to High A Potomac to start in 2008. Crosby will be attending Illinois in the fall. St.Clair decided to return to Rice for his senior season. Round 8) Christian Colon,SS High School,Unsigned by San Diego. Colon will be attending Cal State Fullerton in the fall. Round 9) Julian Sampson,P High School,SIGNED by Philadelphia. Sampson pitched 2 scoreless innings in his only appearance for the GCL Phillies. Sampson should return there in 2008,with a chance of going to short season Williamsport with a fast start. Round 10) Kevin Patterson,C High School,Unsigned by Chicago White Sox. Patterson will be the full time catcher for Auburn in 2008. Not bad for my first effort. We will continue to follow these guys next year especially the signed players! Another cowardly Flyer thug injures someone and the NHL slaps them on the wrist. Patrice Bergeron will miss a month with a Grade 3 concussion (the most serious) after being hit from behind by Randy Jones. Jones got 2 games off the ice.Big suspension. Get used to this stuff with Paul Holmgren running the Flyers. Juwan Howard to the Cavaliers? Peter Bondra retires after a good career. Bondra will now be the GM of the Slovakia national team. Bondra was a good,not great player that played a bit soft,but the numbers do not lie. A very good goal scorer in his day,Bondra twice scored 52 goals in a season. Finally,stay tuned for a few things in the future that I am in the process of lining up. They should be good reads for you! Browns win a road game??? But Braylon Edwards had a career game and Derek Anderson threw 3 touchdowns to lead Cleveland to back to back wins and a 4-3 record with a 27-20 w in in St.Louis. Edwards grabbed 8 passes for 117 yards and 2 touchdowns and was generally the supreme player on the field. However after one big catch,the old Braylon slipped out with a brash show-off move and removed his helmet for a 15 yard penalty. Dumb football and to Romeo Crennel's credit,he was telling Edwards about it after the possession's end. You can get away with that against the Rams,but not handing 15 yards of better field position against better teams. The Browns defense was not great,but did come up with two stops late in the game and was able to seal the game away. A stop of the Rams Brian Leonard on a 4th down run play from the Cleveland 16 enabled one drive to be stopped and after a Cleveland punt,a Ram drive was killed by an interception by Leigh Bodden. 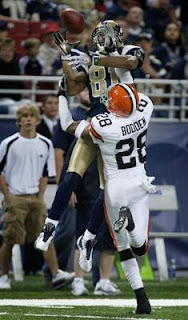 Bodden's pick salvaged a less than stellar game as he had a rough time coverin g the Rams Torry Holt. Holt finished with 6 catches for 110 yds and 1 Td against the Browns top cover corner. Holt was one of my favorite players,so I like to see him do well as long as the Browns get the win. That is also why Holt's catch is pictured! Not a pretty game and the opposition was weak,but a win counts the same no matter the opponent and a road win to boot. I hesitate to bring this up,but the Browns are 4-3 with 3 tough games coming up vs Seattle,at Pittsburgh and at Baltimore. IF (and that is a BIG if) the Browns can get at least one of those 3 games and go into the final six games at 5-5,I like the Browns chances of MAYBE getting a wild card. Looking at the last 6 games,there is not one that screams automatic loss-home games vs Houston,Buffalo and San Francisco and road games at Arizona,New York Jets and Cincinnati. It is early,but that looks at least possible and I would never have dreamed that after Game 1! Sorry to see the Red Sox win the World Series so easily,but it was not exactly a surprise. As long as New York lite spends more money than anyone else but the Yankees and continues to do so intelligently,look for Boston to be a fixture at the top for quite a while. Very much looking forward to this weekends big fights. Showtime has one of my favorites with Juan Manuel Marquez defending his WBC Jr.Lightweight belt against the rugged Rocky Juarez. I wont be able to see the bout until I return home,but I will be watching an even more important bout. The two best 168 pounders in the world square off in Wales on HBO as WBA and WBC champ Mikkel Kessler battles Joe Calzaghe. My picks on these fights Friday before my hiatus. 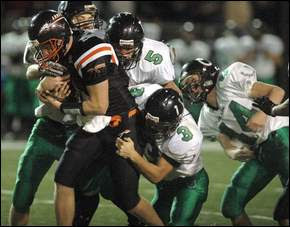 The Ashland Arrows will play the Powell Olentangy Liberty Patriots Friday night. Which means I miss it. One of these days,I have to be smart enough to maneuver my schedule for playoff football possibilities. And finally-Now that the baseball playoffs are finished,who are you going to miss more? Dane Cook or Frank Caliendo? I will live a full life without seeing either for quite a while. tur ned out to be for nothing as the Buckeyes dominated the Nittany Lions 37-17 in a game that really was not even that close. Todd Boeckman's three passing touchdowns kept the vaunted "white out" crowd reasonably quiet,while Chris Wells rushed for 133 yards and was able to control the ball. Ohio State made a point of picking on corner Justin King and was able to complete passes for long gains on King's side of the field with both Brian Robiskie and Brian Hartline. Other than the first Penn State drive for a touchdown,the Buckeye defense was able to keep the Lion offense under control and once the second quarter began never allowed Penn State to feel that they were in the game. While Jim Tressel's troops were doing their best in State College,the New Jersey Devils finally returned home to drop the first puck against the Ottawa Sen ators. Sadly,they brought the same weak offense to their new home in a deceiving 4-1 loss . Deceiving because the Senators scored an un-needed empty net goal with 2 seconds to go and the game was tied at one entering the final period. Actually,if you overlook the continuing bad offense,it was a fun game to watch and both teams played well. The problem as I see is this,the style the Devils are playing may be more fun to watch and should shut the whiners about the Devils playing "dull" hockey up for a while,but the wins aren't there. I would rather see the Devils win 2-1 in dull fashion than lose 5-4 in an exciting game. Some people seem to be unable to understand that. The only Devil goal went to Brian Gionta on a deflection off the skate of Ottawa's defenseman Anton Volchenkov. That pretty much sums up the Devils offense night. Brent Sutter continues to criticize the teams effort and I don't agree. not a great amount of talent to play that system. The Devils defensive style was made to allow them to have a chance to win against more talented teams,this style negates that edge and it is becoming apparent that the talent gap is wider than originally thought. I am not saying dump Sutter and return to the old system,the commitment has been made and I want to see it through,but being realistic-there will be growing pains. The Devils return to action Wednesday at the Rock vs Tampa Bay and Devil killer Vincent LeCavalier. The 3-3 Cleveland Browns travel to St.Louis to battle the 0-7 Rams. This has the feel of a trap,but we will take the Browns 31-20. From a television point of view,the Prudential Center shows up very well on TV. The ice looks great and the lighting makes it very easy to follow the puck. Finding the puck on TV can be difficult in some arenas. The Rock looks like a winner. Nice to see 134 year old Joe Paterno was able to get through the game without having a take a bathroom break this year. or should it be Way to hold it,Joe??? On the topic of Penn State and their hyped "White out". Did any of these geniuses realize that they should go all Blue? The team wearing white was Ohio State! Looks more and more like the Buccos are going to go after John Farrell as the new manager. We aren't big NASCAR fans,but one thing that has always bothered us about the Busch series (the AAA equivalent) is that they allow the top drivers to drive there and dominate. Therefore killing off the veteran drivers on that level and ruining their career. The reason is so that the younger Cup drivers can get extra experience. Can you imagine the Cardinals sending Albert Pujols to play at Memphis on Cardinal off days to gain experience???? Big welcome to new reader Kevin Foster. Glad you liked the blog enough to become a regular! And finally,a tip of the cap to the Hagerstown Suns. We rarely give them credit,but their trick or treat event yesterday at the Muni was a pretty nice thing to do and we like to give them credit when it is deserved. With only the 4th quarter to play,the Lexington Minutemen were 12 minutes away from concluding their run from winless to OCC Champions. Holding a 28-17 lead and with the home crowd rocking,the OCC title seemed to be headed to Lexington. But Taylor Housewright had other ideas and with a 16 point 4th quarter,the OCC trophy would continue to reside in Ashland after a 33-28 Arrow win. 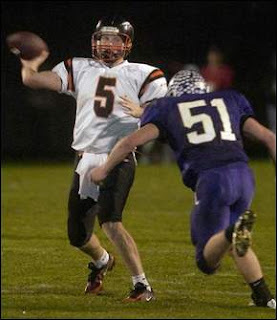 The senior signalcaller threw for 349 yards and rushed for an additional 96 and threw for three touchdowns as well. Two of the TD's went to wideout Tyler McFarlin,one of which was the 58 yard strike to give Ashland the lead that they would not relinquish. Logan Kerr caught a 73 yard bomb from Housewright for a first quarter TD for the other Arrow aerial score. In addition to the conference title,the Arrows caught another break as according to Joe Eitel's site,things fell perfectly and it appears that Ashland will move to 4th in Region 6 and therefore will host a home game. No word on a date yet,but here is hoping for a Saturday,not Friday,so that I can attend. The top ranked Ohio State Buckeyes and their stalwart defense travels to State College tonight to play the 25th ranked Penn State Nittany Lions. Beaver Stadium is a tough place to play and I have picked Penn State to win this game all season. But I have changed my mind after Penn State allowing 31 points to Indiana last week. Their defense could have been exposed,so Reluctantly-Ohio State 20-14. 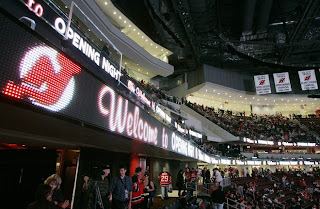 The New Jersey Devils open their new home on Newark tonight against t he Ottawa Senators. 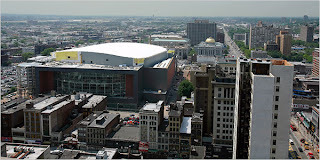 I doubt the new arena will help much against the skilled visitors from Canada's capital city,but one can hope. The Pirates made another claim yesterday. This time it was pitcher Phil Dumatrait from the Reds. it doesn't hurt anything and the cost is reasonable. I like these types of moves,not many of them will pay off,but if a few do,it is well worth it. In a really cool idea,the Los Angeles Dodgers are trying to return to the old Coliseum for 1 game this season as part of their 50th anniversary in Los Angeles. I love stuff like this and will be a must watch if they can pull it off. The configuration of the Coliseum means a 250 foot pull down the left field line and to deal with that,the Dodgers used a 42 foot screen to knock balls down into the field of play. Danny Markov is now off the Devils radar as the blueliner signed a 2 year 4 million dollar deal to play for Moscow Dynamo in the Russian Super League. Think I have figured out the site of the old Richfield Coliseum. It is now called Richfield Grasslands and it is part of the Ohio Audubon Society. I hope to get some pictures! Marty Brodeur played his best game of the year and basically stopped the Rangers all evening,except for one Ranger. That was someone named Nigel Dawes,who scored both Blueshirt goals in a 2-0 Rangers win. The loss concludes the horrific road trip at 3 wins,5 losses and 1 overtime loss for 7 points. Not a great trip,but not a total disaster and the Devils now will h ave to take advantage of the extra home games from here on out. Marty did more than one could ask for as the first Dawes goal left him out to dry as Johnny Oduya and Karel Rachunek screwed up a pass. Rachunek attempted to pass to Oduya,who wasn't paying attention as he left the ice. Dumb play by Rachunek and Oduya might have been paying attention a little more to the game. In any case,Brodeur actually,In my opinion,played better than Lundquist,but the win is what counts,but it is nice to see Marty rounding into form. The defense was not as awful as it has been lately,with the exception of the mentioned miscue,but simply no offense at all. Some of these guys need to step up. The Devils play their 1st game in the Prudential Center Saturday vs the high-flying Ottawa Senators. Tonight in Lexington is the big OCC title game between the Ashland Arrows and the Lexington Minutemen. The game is televised locally,but I am unable to see it. I wonder what happened last night in Fox Sports Ohio headquarters. Midway through the first quarter of last night's Strongsville-Solon battle,the screen flickered and for the rest of the night showed the Columbus Blue Jackets vs St.Louis Blues off the St.LOUIS feed! Kudos to Ryan for pointing out LastFM. This site tracks all the music that you listen to and offers similar bands that might interest you and much more. A great gadget and I am enjoying it thus far. This story is from the "slow day" pile that I kinda accumulate for days like this. You know the type-baseball over,football on weekends and no Devils. 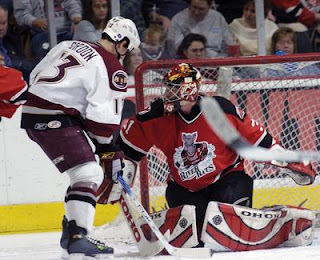 On March 19th 2006,we went to a AHL game in Hershey Pa with the home Bears playing the visiting Albany River Rats. The Rats were in their last season as the Devils top affiliate before the Devils bought the Lowell franchise,so that is why we were there. Anyway without knowing it,it was Penn State night at the Giant Center. And one of the two Penn State players there was Paul Posluszny. Posluszny was coming off an excellent junior season that won him the Butkus award for best linebacker in the country. My problem was this-as good as he was,he wasn't even the best linebacker in the CONFERENCE! That honor belonged to the Buckeyes A.J. Hawk and Ryan,who rarely agrees with me on Big Ten football, was even in agreement. And this night was before Hawk was a Packer draftee! So after this PSU night was announced,Ryan,Rachel (love that girl) and I booed loudly just for Penn State. That of course got some dirty looks from the many Lion fans in the crowd,but we didn't expect that was coming up during intermission. Posluszny and another Lion came to center ice for an award,so naturally that led to yelling at him with gems such as "you didn't deserve it","A.J's better"etc. The fans were getting a little upset,but then each player moved to the end of the ice for a contest of shooting the puck from the end into the center circle. Kind of a shuffleboard on ice,LOL! So,on his first try,he "tops " the puck and it goes far short of the circle. So of course,I yelled "A.J. would have put it right in the center"! That at least got a few laughs from our section,as Posluszny prepped for his second shot. This was better and was on the outside fringe and drew cheers from most and light hearted boos from us. Later in the game,they were introduced from their seats and we booed again and the best part was watching Paul point to us across the rink and laugh with his teammate about it. Nice to see that he took it all in good fun and as a result,I don't even mind the guy,despite him being from Penn State! BTW-The Bears won the game 2-1 and the pic is from that game. Here is an interesting column by Jim Litke on the mercenary aspect of the Boston Red Sox or as we know them here-New York Lite. The Baltimore Blast ( an indoor soccer team) will televise four games on Maryland Public Television this season. We aren't soccer fans and likely would not be a viewer,but kudos to MPT for adding something different to their station. Now,for the next step,lets add an occasional baseball game from Bowie,Frederick or Hagerstown. And finally,Pirates top prospect Andrew McCutchen is doing a blog from the Arizona Fall League,as is former Hagerstown Sun Justin Maxwell. Their blogs and other players doing them can be reached here. Time to do a little thing that we call Random Ramblings. Think your employer screws you over? 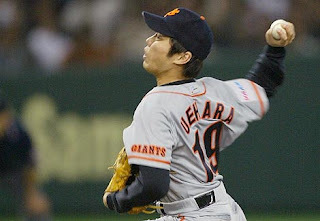 Imagine that you are Koji Uehara of the Yomiuri Giants. The Giants were pissed at him so they forced their best starter to pitch from the bullpen all year. Then after he missed a small amount of time with injury,he came up a few days short of being allowed to leave for America. So the most wanted Japanese pitcher for 2008 will not be available. Glad the Giants are not my boss!!! Selena Roberts column in the New York Times wonders if the timing of the Paul Byrd HGH leak before Game 7 of the ALCS was a conscious one. The chairman of the committee looking into the performance enhancements,former Maine Senator George Mitchell, is an avowed Sox fan and serves as a member of the Red Sox board of directors. In addition,the column looks at the fact that no Boston player names has come up in any rumors and wonders if the Red Sox players have gotten a pass. Not sure how I feel on that part,but if you think the Byrd leak was a coincidence-you are pretty naive. The Hardball times looks at post season trade blockbusters from the past. Remember the good old days when you improved your team by swapping players and not signing checks? The NFL committed further to the NFL Network,cut the time between picks during the draft,trimmed the draft's first day from 3 rounds to 2 and considered a proposal to allow the Bills to play one game a year In Toronto. The changes to the draft are all tremendous,should streamline things and make the draft better television. The NFL network needs to tweak some programming,but deserves to stick around,while my thoughts on the NFL in Toronto have been commented on in the past. Jermain Taylor has exercised his rematch clause for a Middleweight title shot vs Kelly Pavlik. The likely site is Atlantic City in the winter of 2008. Remember the general rule of thumb-when one fighter stops the other,the rematch usually has the same result,but faster the second time. No word on the Pirates managing job yet. I would still say the top contenders are Torey Lovullo,Joel Skinner and John Farrell. Of those three-if I was hiring,I would hire Lovullo. Looks like the Hagerstown Suns will get the new infield that Municipal Stadium needs so badly. The Washington County Commissioners voted to kick in some dough on a 3-2 vote. You have my word that the two Nay votes wont be getting any votes from this household next time they run! Now lets get to work on the funds to fix the outfield portion of the Muni! Prepping for my upcoming vacation. I have some things planned and some things that depend on the breaks. Will be attending the Buckeye Book Fair on November 3. Former Pirate and Indian Jim "Mudcat" Grant will be signing his book,so I am hoping to slide a few cards for him to sign as well. I also will spend a few hours on November 4 in Richfield Ohio as I am attending a comics show and will attempt to find the actual site of the old home of the Cavaliers,Barons and Crusaders-the Richfield Coliseum. The Coliseum was demolished in 1999 and here is how they did the demolishing. For more Coliseum pictures of the old girl in her last days,check this out. If I can find it-pictures here of course! Whitey's is supposed to have great burgers and was a regular hangout for Cavaliers and Crusaders when the Coliseum was intact. And (my largest interest) is supposed to have a huge amount of Cavalier and Crusader memorabilia around. I was all prepared to open with the blame game after 7 innings of last nights Game 7 of the ALCS. Bad umpiring,poor base running and below average base coaching,but after the Boston barrage in the eighth to make the final a deceiving 11-2,one can blame nothing at all. Cleveland sent their two top pitchers to the mound 4 times and came away with an 0-3 record with a no decision. When your top hurlers produce that little,it makes it tough to win series against quality teams. Look no further than C.C Sabathia and Fausto Carmona. Last night had its share of bad breaks,but after the Boston 7th,none of those cost the game for the Tribe. Yes,the umpiring cost Cleveland 1 run after Kenny Lofton was called out at second as he tried to stretch a single into a double. The replays showed Lofton clearly safe and the next three hitters all hit singles. And the odd decision by Joel Skinner to hold Lofton at 3rd ,when he would have scored easily, cost them another run in the seventh,but both plays looked like they would be far more important than they turned out to be. In the end,the better team won-no excuses. Lets hope Mark Shapiro has learned from this experience and adds some more pitching. In the playoffs,pitching wins every time. 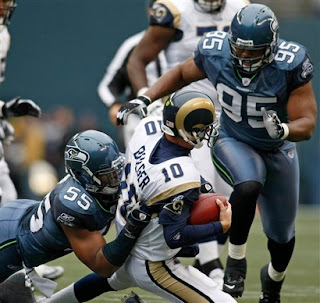 The Seattle Seahawks defense dominated the winless St.Louis Rams and the offense played just well enough not to hurt things in a 33-6 Seattle romp. Outside of two Matt Hasselbeck touchdown passes to tight end Will Heller (one in garbage time) the offense generally was blase'. Josh Brown booted 4 field goals with 3 being 43 yards or longer and Nate Burleson took the second half kickoff for a touchdown,which basically ended the game for the visiting Rams. But Shaun Alexander struggled again and Hasselbeck seemed to suffer communication problems with receivers on many occasions. Most of these seemed to be with veteran Bobby Engram. There is no reason to have these type problems with players that have been with the team for years. The defense had 7 sacks,led by Darryl Tapp with 4,but I did question the coaches keeping Tapp in the game after a hand injury that was clearly visible. Why keep a key player that is banged up in an already decided game? Let me know if you can figure that one. The 4-3 Seahawks moved into sole possession of first place in the NFC West with the Cardinals loss in Washington and have a bye week next week. Seattle returns to action November 4th in Cleveland vs the Browns. Rumors are flying that the NFL Network could be in trouble. Their 8 game package of late season games could be going elsewhere and a few owners would like to drop it completely. I like the NFL Films stuff,but they tend to show the same shows all the time and that gets old. Besides 10 minutes of Rich Eisen is too much,let alone replaying the same show of his for 10 hours of the day. Was preparing a DVD of an XFL game for a trader and decided to watch a bit to see how it holds up 6 years after its 1 year run. It looks even cheesier than I remembered. I still think that spring football can work,but a setup similar to the USFL is what is needed. Deep pocketed owners that sign top notch talent and then can afford the inevitable long term money losses until the profits come in way down the road. The ORIOLE first baseman was using words for the Red Sox as "we and us". If I were an Oriole fan,I would be pretty mad. 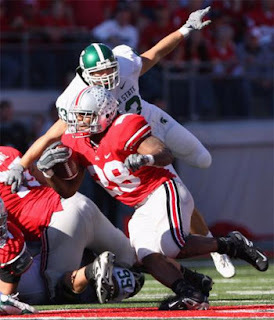 Buckeyes hold off Spartans,Devils lose in Overtime and Tribe trounced. o n their way to a blowout win over the Michigan State Spartans. Instead the Buckeye offense began to have trouble holding onto the football,which allowed Michigan State to get back into the game before Ohio State ran out the clock. The 24-17 victory was OSU's 8th of the season and pretty much ends the games that figured to be guaranteed wins,as the schedule gets far tougher from here. Chris Wells was the star of yesterday's game finishing with 221 yards,a touchdown and being the end of the game workhorse in running the clock out. The only downside to Wells yesterday was his fumble that was scooped up for a Spartan touchdown. Todd Boeckman threw 2 touchdowns,a 1st quarter toss to tight end Jake Ballard and a 50 yd bomb to Brian Robiskie that was the only Buckey e second half points. The Ballard catch was a tremendous catch of a high pass and showed that Ballard is beginning to come into his own as a pass catching tight end. Boeckman threw one interception that was returned for an MSU TD. So in effect the Ohio State defense allowed just 3 points. The offense needs to step up next week for the visit to Penn State. The Nittany Lion defense is vulnerable as the 31 points they gave up yesterday to Indiana showed,but the offense needs to keep the ball secure and be able to control the ball. The Cleveland Indians were drilled 12-2 by Boston in Game 6 of the ALCS as Fausto Carmona allowed 7 runs in 2+ innings in a walk filled outing. Victor Martinez hit a solo homer in the only Cleveland bright spot. Not much else I can say about this bad night. 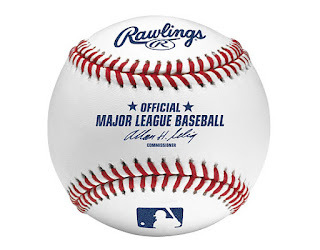 Game 7 tonight and it is winner takes the American League pennant. Jake Westbrook for Cleveland vs Daisuke Matsuzaka for Boston. 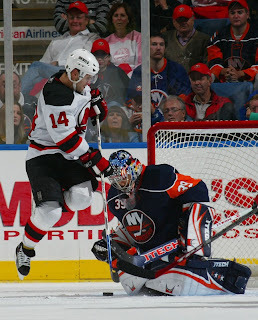 The New Jersey Devils were behind 3-1 entering the final period,but did rally to force overtime (gaining a point) before former Devil Bill Guerin slid the game winner through Kevin Weekes with three seconds remaining in the overtime period to give the Islanders a 4-3 win. Zach Parise scored the only first period goal(2) 55 seconds into the game with the assist going to Dainus Zubrus,but the Devils were dominated in a bad second period and allowed 3 Islander goals. Jay Pandolfo cut the lead to 3-2 early in the third period with his third goal of the season,assisted by Sergei Brylin and Rod Pelley. After killing off a four minute penalty to Brian Gionta,Gionta struck back with his 2nd goal of the season to tie the game. Gionta was assisted by Zubrus and Paul Martin. Again,a nice effort to rally and earn a point,but the Devils keep having one bad period a game and it is killing this team. The defense has been poor once you get past Paul Martin and Andy Greene. New Jersey finished this road run Thursday at Madison Square Garden vs the Rangers. The Browns are on bye,but the 3-3 Seahawks are at home aga inst the 0-6 Rams,. Seattle still tied for first with Arizona needs this game for the standings,but as a confidence builder as well going into the bye week. Learned something new from the NYI announcing team that I had not noticed. The Devils players are all numbered from 1-30 with none of the higher specialty numbers. Islander play by play man Howie Rose said that Devil GM Lou Lamoriello had told him that was done as a small nod to the "team" concept of the Devil organization. 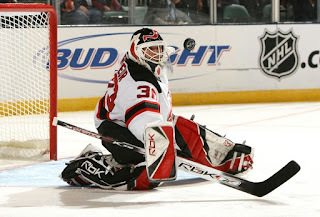 I noted before the game in my game note that I wish the Devils had been able to bring Bill Guerin back last off season. I think he would have added a lot to the team and after his game winning goal-I really wish that! Former WWE and NCAA Heavyweight champion Brock Lesnar has signed with IFC to compete in the ultimate fighting universe. UFC doesn't do much for me,but good luck to Lesnar. Sorry to hear about former Packer Max McGee passing away after a fall from the roof of his house. McGee is most remembered for scoring the first TD in Super Bowl history. Help me out a bit! Today's Forgotten Superstar is a player that has been a favorite of mine s ince I was a young child. Al Oliver comes up a hair short of being in the Hall of Fame,but regardless,Oliver was an awesome hitting machine. The seven time All-Star was not a huge power hitter as he hit 20 or more homers just twice,but he was consistently in the 12-19 range,which is equated to the 22-29 homer level today. But what an average hitter,Al Oliver hit below .280 just once from 1969-1984 and was never below .290 after his .270 performance in 1970. The lefty with the sweet swing never seemed to get the recognition he deserved as he was overshadowed by first Roberto Clemente and then Willie Stargell in his Pittsburgh years,ignored by the media during his run with Texas and again overlooked in Montreal in favor of teammates such as Gary Carter,Andre Dawson and Warren Cromartie. Oliver was also an underrated RBI player as in his Pirate years he averaged 80 (actually 79.6) RBI per year and only a 61 RBI year in 1976 in which he missed some time with injuries kept the average from being higher. Al's four year run in Texas with the Rangers stacks up as one of the best stints in Rangers history. Oliver never hit below .309 in Texas,with a high of .324,hit 49 homers and drove in 337 runs in the tenure with a career high of 117 in 1980. The Rangers for some unknown reason began leading Oliver off in 1980 and he only had 55 RBI,still a respectable number for a leadoff hitter. After his move to Montreal produced a phenomenal 1982 season in which Oliver won the batting title (.331),the shared RBI title (109) with Atlanta's Dale Murphy,led the league in hits,doubles and total bases,Oliver could be looked at as deserving of the MVP. Oliver also hit his career high in homers in 1982 with 22. Oliver likely lost his chance at Cooperstown due to a surprisingly fast slide. In 1984 as a Giant and Phillie,he failed to hit a homer in 119 games,despite hitting .301 and in 1985 with the Dodgers and Blue Jays,his average fell to.252 with 5 homers (all in Toronto). I got to meet Al at a card show about 15 years ago,very accommodating as far as fan interaction. Al Oliver may be just short of being in the Hall of Fame,but certainly an excellent player and a forgotten superstar. The top ranked Ohio State Buckeyes take on the visiting Mi chigan State Spartans in Columbus. The Spartans are improved but in the end the Bucks survive and move on to the big game at Penn State. Here is more on the Buffalo Bills and their seed planting for engaging the Toronto market. The Bills reportedly will ask permission to play 1 home game at the Skydome in 2009. Ryan sends us this link to the troubles in the Nebraska football program. Seems that the Husker want to sweep their tradition and past stars under the rug to keep reminders of past glory (and current failures) away from being noticed. New AD Tom Osborne has already taken steps to return the Cornhusker program to past glory. Count on one of the moves being the firing of the head coach Bill Callahan. Callahan and Nebraska seemed like an odd fit from day one and that turned out to be the case. The Ashland Arrows cruised to a 42-21 win over the Clear Fork Colts to set up next weeks OCC title tilt vs the Lexington Minutemen. The Arrows had another great game from Taylor Housewright,as Housewrigh t threw for three touchdowns and ran for three more. Lexington had to march 80 yards in the final two minutes for the winning touchdown to nip West Holmes 21-20. Both teams will enter the game 8-1 overall and 6-0 in the OCC and in addition the two teams are in the same region for playoff spots. Both schools clinched Region Six playoff spots with their wins last night,but the winner will improve their seeding as the winner is guaranteed to move up to the 5th seed in the tournament and possibly higher depending on other results. The top 4 seeds host first round games in the playoffs. As of now Lexington would be the 6th seed with Ashland the 7th seed. The Cleveland Indians seemed to have everything in their favor last night. Their best pitcher on the mound,the game in Cleveland and momentum on their side,but they didn't have Josh Beckett and as a result lost to the Boston Red Sox 7-1. The Red Sox had all they needed with 2 runs,but pounded C.C Sabathia and the Cleveland bullpen for 5 runs in the 7th and 8th innings. Sabathia allowed 4 runs in 6+ innings and didn't pitch poorly,but could not match the effort of Beckett. Boston jumped out early in the first on a Kevin Youklis homer and could have added another in the inning,but a strong throw by Franklin Gutierrez gunned down Manny Ramirez at the plate. Ramirez likely would have been safe had he even mildly attempted to slide,but in a Mesneresque effort did not. Sabathia has not been at his best in the postseason and seems like he could be one of these players that just is not at his best in big games. I remember the Pirates had a guy like that (Back when the Pirates actually played big games) in John Smiley. Smiley could be depended on for 15-20 wins,but in his post-season games was virtually worthless. Game 6 in Boston Saturday night. Fausto Carmona for Cleveland against Curt Schilling for Boston. The Indians need to win that one,if it gets to Game 7,I like the Red Sox. The New Jersey Devils paid the price for back to back games and despite peppering Martin Biron with 39 shots lost to the Flyers 4-0. The Devils allowed 3 goals in the second period and never seemed to threaten after that. Dainus Zubrus did appear to score one goal,but it was ruled to be kicked in. I didn't see a kicking motion,but the video guys in Toronto didn't see enough evidence to overrule the officials. Would not have made a difference anyway in the game. Marty seems to be more susceptible to the long range shot or the crazy angle shot than most goalies. I have always wondered why more teams did not attack him that way. The Devils travel to Long Island to take the Islanders Saturday night. Well,one of the top candidates for the Pirates Scouting Director job is Dave Holliday of the Rockies and his stance on these issues is worth knowing. After all,the Pirates have plenty of great guys in the system already that are not great prospects,we really don't need to be picking players based on their fervent (or not) religious beliefs. 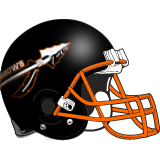 The Ashland Arrows attempt to keep their hopes fo r post- season play and the OCC Championship alive tonight in their home finale vs the Clear Fork Colts. Clear Fork always is a tough,but running first team,so if the Arrows can jump out early,they should cruise home with the win. One card came in the mail last week from Marlins pitcher Taylor Tankersley from last spring training. SAL and Carolina league schedules are out for the most part,so the 2008 tour is in the planning stages already. 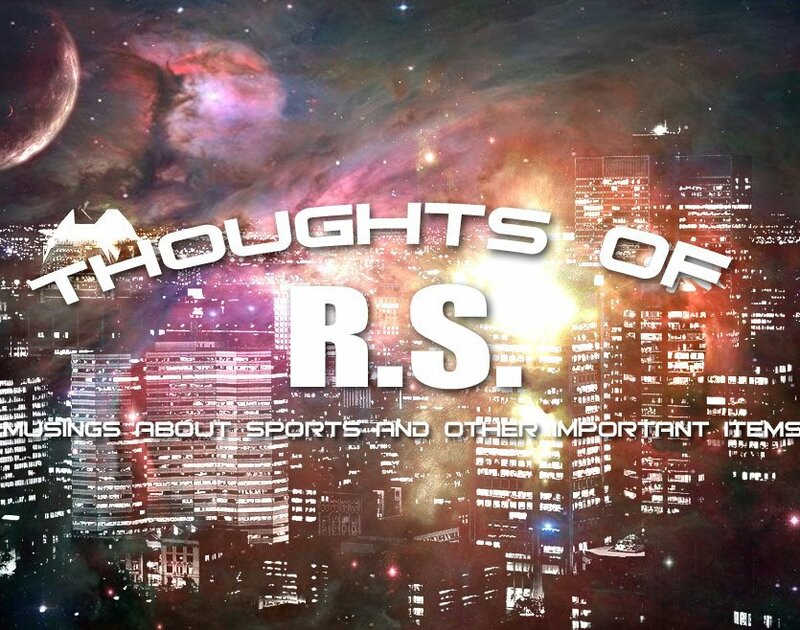 Back tomorrow with either some random ramblings or a feature of some kind with no Indians or Devils action tonight. Right after George Bush's win without winning and his appointed election by the Supreme Court. Right after the horror that was September 11th. Did anyone think that by 2007 that George Bush could arguably be ranked as the worst president of all time? Or at the bare minimum,a top 5 lock? And that his opponent,the man that was jobbed out of the election would be a Nobel Peace Prize winner and thought of as a man almost above politics? Sometimes the old saying "what goes around comes around" actually is true and for George Bush it truly has done so. When you "win" things that you don't deserve,your own incompetence gets you in the end. Like in sports when the hot team wins game after game that they shouldn't,inevitably the tank runs dry and the pendulum swings to the natural balance of things. In this case,Bush got the job and the tainted victory,but in the end what did he really win? Reviled around the world,disliked by his countrymen and doomed to be studied and remembered by historians as a president controlled by oil interests and his domineering Vice President. Meantime the vanquished Al Gore will be remembered as an excellent Vice President,the winner of the popular vote in the scandal filled 2000 election and instead of crawling into a bunker,working on publicizing an important (and possibly the most important) issue to the attention of the general public. As we look back,who really got the better deal? Looks like the Washington Nationals and/or MASN either received lots of support or realized they made a mistake,but the network has offered Bob Carpenter an extension on his contract after initially telling him that he would be not offered a new deal. Reportedly,Carpenter is considering the offer. Let's hope he takes it as this whole thing was a dumb move by MASN to begin with to break ties with the skilled Carpenter. 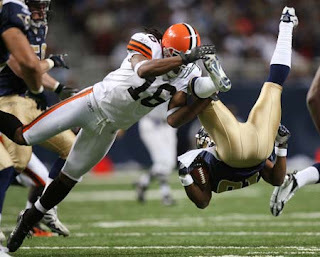 More news on the Arena Football league coming to Cleveland. The team is taking a fan vote to decide to keep the name of the Las Vegas team (Gladiators) or select a new one. Bernie Kosar will be serving as the franchise President and CEO. A link to the team page is here. A note on Arena Football. I have tried on a few occasions to try to "get into" the AFL and nothing seems to work. I thought maybe a Columbus team with lots of Buckeyes might work,but it really didnt and I am sure I might give the Cleveland team a try,but I am dubious of this as well. Just not sure that it will ever be something that I become a fan of. Finally-prior to last night's Devils win over Pittsburgh,winger Nicklas Bergfors was demoted to Lowell. Likely a good thing as other than the opener vs Tampa,Bergfors was scratched every game since. Why keep the guy up,if you are just scratching him? Since we last had time to write,the Cleveland Indians moved to within one game of the World Series with two wins at home over the Boston Red Sox. Game 3 went to the Tribe 4-2 in a game most notable for Jake Westbrook's gutsy seven inning effort and Kenny Lofton's two run homer off the high-priced Daisuke Matsuzaka. 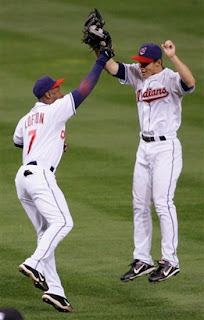 Lofton's second inning shot into the seats gave the Indians a lead that they would never relinquish. The Indians added two runs in the fifth on a Asdrubal Cabrera single and Travis Hafner fielders choice,runs that were needed as the Red Sox would add two runs in the seventh on a 2 run Jason Varitek homer. Westbrook got the win and Joe Borowski fired the ninth to earn the save. The Wahoos then added Game 4 to their belt with a 7-3 win. The Indians plated all seven runs in the fifth inning and held off a 3 solo homers in a row barrage by the Red Sox in the sixth to give Paul Byrd the win. Byrd allowed two of the homers and took the win after allowing two runs in 5+ innings. Casey Blake's solo homer gave Cleveland the early lead and singles by Asdrubal Cabrera and Victor Martinez scored two more runs. Jhonny Peralta's three run homer then put the game solidly in the Cleveland win column. Game 5 in Cleveland will see a pitching rematch of Game 1 with C.C Sabathia for the Indians against Josh Beckett for the backed against the wall crimson hose. Arron Asham broke Pittsburgh hearts with his 3rd period goal(2) to lift the New Jersey Devils to a 5-4 win over the Penguins and then followed up a few minutes later with a bop to the nose of Sidney Crosby. I am not sure which I liked more!! The Devils led 2-0 early with two goals by their "defensive" line as Jay Pandolfo (2) and John Madden (4) each popped in 1st period goals. Each player assisted on the each others goals and David Clarkson picked up assists on both goals. After 2 Pittsburgh goals tied the game at 2 after the first period of play,the Penguins grabbed the lead early in the second on a power play goal by Sergei Gonchar. The Devils roared back to tie and take the lead on two power play goals by Travis Zajac (2 and 3). The first Zajac goal was assisted by Zach Parise (first of three in the game) and Paul Martin,while assists on the second went to Parise and Brian Gionta. The Penguins tied the game before the end of the second and that led to the only goal of the third period,Asham's game winner. Asham's goal was assisted by Parise and Patrick Elias. The win improves the Devils to 3-3 on the year with 6 points and only three more games on this murderous road trip. The Devils battle the Flyers in Philadelphia today at 7:00. The hot rumor for the Pirates managing job has the job going to John Farrell. 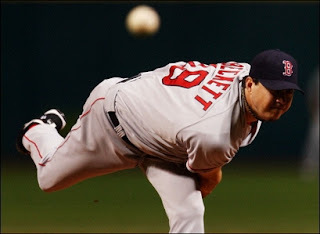 Farrell,a former Indian pitcher and farm director is currently the Red Sox pitching coach. To me,if the job goes to anyone other than Farrell,Joel Skinner or Torey Lovullo,it would be a surprise to me. The Arena Football league has returned to Cleveland. A game on today on MASN from the Hawaii Winter Baseball league. I will watch it when I can and if any Pirates or Indians are playing,I will give a report. Back later with the promised political post with anything new sports added! After the results of the first six games of the NFL season,both the Cleveland Browns and Seattle Seahawks are 3-3. This is surprising to me on both fronts,as I didn't think Cleveland would be able to be 3-3 due to a tough schedule and especially after their horrid opening day vs Pittsburgh. Nor did I think that Seattle would lose 3 games early on,but both are,to my great surprise. 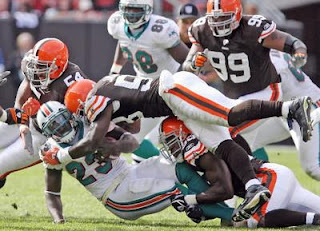 The Browns defeated the Miami Dolphins 41-31 in a game that was not as close as the score indicates. Cleveland raced to a 24-3 lead,allowed the Dolphins to close to 27-24 before turning the jets back on and pulling away. It almost seemed like they allowed the Dolphins to catch up and then devastate them by pulling away just when Miami thought that they had a chance. Derek Anderson threw three touchdowns-all three to Braylon Edwards and added a rushing touchdown to boot. Even more encouraging was the fact that Anderson did not throw any interceptions. Jason Wright scored the games first points on a one yard touchdown run. Wright was playing in place of the injured Jamal Lewis and finished with 59 yards on 20 carries,but the better ground performance went to Jerome Harrison,who rushed for 57 yards in just 8 carries. If you remember back in the Browns preview,I wondered why the shifty Harrison was not used as a change of pace back and that I thought he could be quite effective in that role. Hopefully yesterday earned him more opportunities to play. The offensive line played well,as Jason Taylor provided the only Miami sack and Joey Porter continued to be a non-factor. The defense still needs to pick things up. 31 points to a Cleo Lemon led team is not a wonderful performance,but the win is what counts and I would have taken 3-3 going into the bye week every time that it would have been offered to me before the season. The Browns return in two weeks in St.Louis against the 0-6 Rams. I wrote in my game picks that I thought the Saints were sitting on a big game and I was right. But I was wrong because I thought the Seahawks could hold them off and tha t was far off the mark. The Saints dominated the Seahawks 28-17 in a game that had it all. Inept offense (although the stats don't show it),bad defense (in the first half) and horrid special teams. Boone Stutz dribbled a snap that eluded Ryan Plackemeier and quickly handed the Saints a touchdown,momentum and a lead that they would never relinquish. Matt Hasselbeck' s stats look great,but they were mostly accumulated late with the Saints trading yardage for clock and when the Seahawks still had a heartbeat,Hasselbeck stepped on it with a pass that could be charitably described as awful. 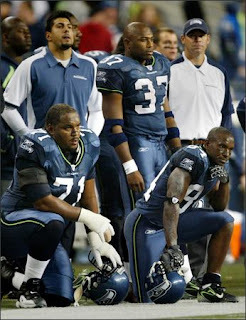 Shaun Alexander had another bad night,but that was more to being behind and Mike Holmgren's bad play calling. Speaking on which-Mike Holmgren has to be the most overrated playcaller in the game. Always a draw on 3rd and long and always a screen pass on third and short. Cannot knock the depleted wide receiving corps,they are doing their best when you consider guys like Bobby Engram and Nate Burleson are your top guys. Usually those guys are 3rd wideouts at best. But the offensive line is supposed to be a strength and when 800 pound Hollis Thomas is able to dump the QB,there are problems somewhere. I could add more,but I would just be adding to the fire. For a better recap-try Field Gulls . They do an excellent and detailed recap every week and I will be adding them to the links page. The Seahawks remain home for a visit from the 0-6 Rams. Get used to hearing about the Rams as they will be covered here for the next two weeks. The ALCS continues tonight in Cleveland with Jake Westbrook defending for the Wahoos against Daisuke Matsusaka for the Dirty Waters. Ohio State did indeed rise to the number 1 ranking. I think I will enjoy it now. Don't think it will last the season. Well traveled minor league outfielder Kevin Thompson was claimed by the Pirates from Oakland today off the waiver wire. Thompson likely will be an Indianapolis Indian,but this is the type of move that I like-Gamble on some of these guys that never got a chance and maybe one or two will pan out.